How do you like to celebrate Independence Day? If in the Chicago area and looking for really spectacular fireworks, you are likely to find none better than the Aon Summer Fireworks’ July Fourth show at Navy Pier. You can make it an all-day Pier experience or go out on a boat to watch. If you like the idea of saluting US troops, love entertainment and enjoy a good fireworks show but don’t want to deal with crowds or transportation concerns, there is a really good, gather-round-the-TV option. The fireworks are spectacular and Navy Pier is a fun destination with good skyline views, its famous Centennial Wheel, games, shops, restaurants and entertainment in the Miller Lite Beer Garden. The Pier does fill to capacity on the Fourth so go early. Hours are 10 a.m. to 10 p.m. on the Fourth. Gates actually close when the pier is filled. but guests with advance tickets for shows or restaurants will be allowed on. See the Capacity and Transportation categories at Navy Pier. Take advantage of public transportation or the Pier’s free trolley service. Offsite parking is cheaper than the Pier’s garages. In addition check the holiday’s Code of Conduct on the same site. For instance, no pets are allowed except service dogs because of the crowds. Watch the fireworks with 3D glasses aboard a Mercury Cruises boat. Mercury is hosting a 2. 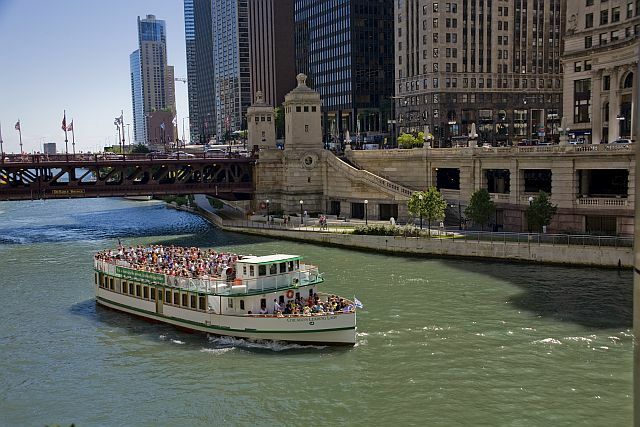 5 hour lakefront, skyline tour that includes Chicago’s spectacular fireworks show off Navy Pier. Guests will be given 3D glasses to enhance the fireworks experience. The cost, $64 adults and $49 children under age 15, includes the cruise, treats and glasses. The cruise leaves at 8 p.m. to tour the lakefront. Fireworks are at 9:30. For tickets and dock location and information visit Mercury Cruises. Watch the country’s annual Capitol Fourth celebration that is broadcast live from the West Lawn. On PBS from 8 to 9:30 p.m. ET, the celebration honors the men and women in uniform and their families with a star-studded concert, then presents Washingtin D.C.’s fireworks. Four-time Grammy Award-winning soprano Renee Fleming will be singing “You’ll Never Walk Alone” from “Carousel,” John Williams be on video on the 40th anniversary of “Superman” and there will be a tribute to the Beach Boys. Also featured are music legend Jimmy Buffett with the “Escape to Margaritaville cast, three-time Grammy Award-winning Pentatonix, pop siner/songwriter Andy Grammer, legendary actress/singer/dancer Chita Rivera, Motown stars The Temptations and multi-platinum country music star Luke Combs. In addition, the amazing lineup also includes, Gospel singer CeCe Winans, Grammy-winning violinist Joshua Bell, The Voice season finalist Kyla Jade and the National Symphony Orchestra led by pops conductor Jack Everly. The celebrations is funded by grants fromn The Boeing Company, the National Park Service, the Department of the army and by the Corporation for Public Broadcasting and PBS. Enjoy, celebrate and be safe.